Sugar is pleasurable and somewhat addictive. Sugar is bad for us, specifically refined sugar and especially high fructose corn syrup (glucose-fructose in Canada). Better with fibre. Juice is not our friend. For years the conventional wisdom was that we should cut down on fat and cholesterol in order to lose weight and decrease our risk of heart attack and stroke. Part of the problem, it seems, is that in cutting fat people increased their consumption of sugar. And there are better (polyunsaturated) and worse (saturated, trans) fats. Sugar is pleasurable to consume and enhances appetite. Sugar, and especially HFCS (high fructose corn syrup), may be as unhealthy as fat and salt, and may be associated with the metabolic syndrome of obesity, diabetes, high blood pressure, and high cholesterol. High-fructose corn syrup (called glucose-fructose in Canada) is made from corn. After it’s milled, the resulting starch is processed into a syrup. By adding enzymes, the syrup is converted into fructose. Glucose syrup is then added to the mix to make high-fructose corn syrup. The most common form of the syrup contains 45 per cent glucose and 55 per cent fructose. Corn is abundant in North America, which helps make high-fructose corn syrup a cheaper alternative. It’s sweeter than sugar and helps extend the shelf life of processed foods. It’s also easier to blend and transport because it’s a liquid. As a mixture, its chemical composition differs from sucrose, and some say that’s critical in its effect on the human body. Critics suggest there’s a link between the increased use of high-fructose corn syrup and a growing North American diabetes and obesity epidemic. Sucrose comes from sugar cane and sugar beets and is our table sugar. It consists of glucose and fructose. Fructose is of concern because it is broken down only by the liver and can cause fatty liver. It is broken down into components including uric acid, which may be associated with gout and increased blood pressure, and triglycerides, which are a form of bad cholesterol. There is concern that fructose, and especially high fructose corn syrup, causes weight gain, diabetes, high blood pressure, increased cholesterol, and fatty liver. While it is true that sugar is found naturally in many foods such as fruits, these also contain fiber, which makes us satiated, so we don’t eat as much, and which slows the absorption of sugar. In March, 2015 the World Health Organization presented the following new guideline: “In both adults and children, the intake of free sugars should be reduced to less than 10% of total energy intake. A further reduction to below 5% of total energy intake would provide additional health benefits.” Free sugar refers to sugar that is added to food, as opposed to the natural sugar that exists in fruits and vegetables, which are not as unhealthy. The WHO says that limiting your sugar intake will decrease your risk of obesity, which is associated with heart attack, stroke, and certain cancers, and dental cavities. The amount of calories that are recommended per day depend on one’s age and gender (here is a guide — http://www.hc-sc.gc.ca/fn-an/food-guide-aliment/basics-base/1_1_1-eng.php). An average adult male should take in about 2500 calories per day, and an average woman about 2000 calories. 10% of 2000 is 200 calories, which is about 50g of sugar/day. A single can of soda contains about 39g of free sugar, approaching the 10% recommendation for an entire day. While most people realize that there is free sugar in soft drinks, candies, cakes, and cookies, many don’t realize that there is added sugar in such foods as bread, pizza, salad dressing, yoghurt, and ketchup. Also, even though the sugar in fruit is ok, that in fruit juice or punch is not because it is ingested without the benefit of the other components of fruit, especially the fibre. Fibre slows down the absorption of sugar and thereby decreases the unhealthy spikes in our blood glucose levels. Moderation seems like the best policy at this time, and we should make an effort to consume less artificially sweetened foods such as soft drinks and get more of our sweetness from fruit. Check the labels of what you are purchasing, and remember to remain physically active, which improves blood sugar levels and helps maintain a healthy weight. Also choose brown rice bread pasta less shooting up of blood sugar. In the uk and us the amount of added sugar is on food labels. In Canada the total amount of sugar is listed, which is a combination of naturally occurring and added sugar. Insulin resistance — While eating sugar by itself does not cause insulin resistance, foods with sugar and fat can contribute to weight gain, thereby reducing insulin sensitivity in the body. worse memory — Although the brain needs glucose, too much of this energy source can be a bad thing. A 2012 study in animals by researchers at the University of California at Los Angeles indicated a positive relationship between the consumption of fructose, another form of sugar, and the aging of cells, while a 2009 study, also using an animal model, conducted by a team of scientists at the University of Montreal and Boston College, linked excess glucose consumption to memory and cognitive deficiencies. Too much sugar can lead to obesity, insulin resistance and inflammation, all of which are risk factors for cancer and are linked to an increased risk of dying from heart disease. A diet rich in added sugar and processed foods may increase depression risk in both men and women. Sugary foods can increase the production of AGEs , which can accelerate skin aging and wrinkle formation. Eating too much sugar can accelerate the shortening of telomeres, which increases cellular aging. High-sugar foods can negatively impact your energy levels by causing a spike in blood sugar followed by a crash. Eating too much sugar may lead to NAFLD (non-alcoholic fatty liver disease), a condition in which excessive fat builds up in the liver. Eating too much sugar may lead to NAFLD, a condition in which excessive fat builds up in the liver. Negatively impact dental health: Eating too much sugar can cause cavities. Bacteria in your mouth feed on sugar and release acid byproducts, which cause tooth demineralization. Increase the risk of developing gout: Gout is an inflammatory condition characterized by pain in the joints. Added sugars raise uric acid levels in the blood, increasing the risk of developing or worsening gout.Accelerate cognitive decline: High-sugar diets can lead to impaired memory and have been linked to an increased risk of dementia. Although consuming small amounts now and then is perfectly healthy, you should try to cut back on sugar whenever possible. Focusing on eating whole, unprocessed foods automatically decreases the amount of sugar in your diet. Swap sodas, energy drinks, juices and sweetened teas for water or unsweetened seltzer. Drink your coffee black or use Stevia for a zero-calorie, natural sweetener. Sweeten plain yogurt with fresh or frozen berries instead of buying flavored, sugar-loaded yogurt. Consume whole fruits instead of sugar-sweetened fruit smoothies. Replace candy with a homemade trail mix of fruit, nuts and a few dark chocolate chips. Use olive oil and vinegar in place of sweet salad dressings like honey mustard. Choose marinades, nut butters, ketchup and marinara sauce with zero added sugars. Look for cereals, granolas and granola bars with under 4 grams of sugar per serving. Swap your morning cereal for a bowl of rolled oats topped with nut butter and fresh berries, or an omelet made with fresh greens. Instead of jelly, slice fresh bananas onto your peanut butter sandwich. Use natural nut butters in place of sweet spreads like Nutella. Avoid alcoholic beverages that are sweetened with soda, juice, honey, sugar or agave. Shop the perimeter of the grocery store, focusing on fresh, whole ingredients. Eating a sugary treat along with foods high in protein or fibre can result in a smaller rise in blood sugar. So make sure kids eat a healthy meal before trick or treating. If followed by a good teeth brushing, parents can also reduce their child’s risk of cavities. Parents of younger children often find they can toss the majority of treats after a week or two as their children lose interest, or even forget about the stash. 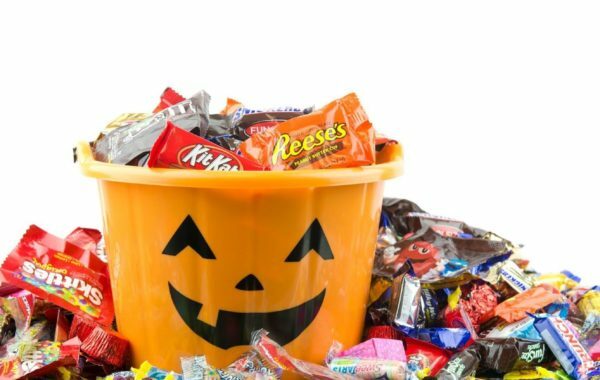 Older children may want to weigh their treats and “sell” them back to their parents for a reasonable price per pound. Other parents implement the Switch Witch. This benevolent helper can visit children as they sleep, trading the big bag of candy they have left out for her — for a small prize. Get moving. Get some exercise by making Halloween a fun family activity. Walk instead of driving kids house to house. Set a goal of how many houses or streets you’ll visit, or compete in teams to do as many as you can. Bring a bottle of water and a flashlight, and wear comfortable shoes for walking!